March 26, 2014; A funny car thief who tried to steal a taxi on Iloilo City fails to robed the car because he did not know how to drive. The thief said were a third year high school student only. 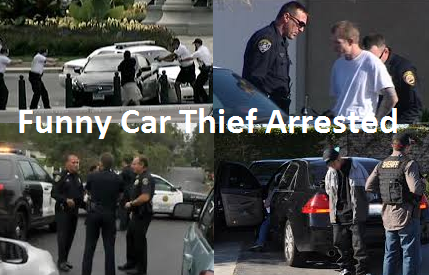 The reason why that child tied to rob a car were not disclosed on the news. As narrated by Taxi driver Reynato Espino (the victim), the said thief alias "Boy" (the suspect) was boarded his taxi in Jalandoni, Jaro and told to bring him on Iloilo City Hall where his mother works but soon announced a hold-up as he pulled out a gun (a replica of a caliber 45 pistol) on him. Then soon, Espino gives everything and including his taxi to the minor and the epic fail happened... The minor thief attempted to take away the taxi but failed because he does not know how to drive that resulted to police arrest. The minor alias "Boy" was brought to the Children and Women's Desk. According to ABS-CBN news, the taxi driver Reynato Espino would no longer pursue a case to that minor after talking with the boy's parents. All parents should always guide and watch over their children specially if they still minor to avoid violent actions that they may do. Neglecting your children or lack of emotional supports may lead to rebellious attitude that may soon result to destruction of their future. For minors, you should not keep in your mind that its okay to do those violence because you will not be put in jail, rather always think of your future and do your best to make your life meaningful and worth living. Speak up your mind by posting comment below, thanks.